Darren DeMatas has built a career helping others bring their dreams online. With his newest venture, (now called Ecommerce CEO), he’s finally shifted his focus to a new client he’s never served before: himself. It’s a new business, and his dream is to create a community where people can start to learn how to use content to market their own e-commerce businesses. Darren’s story is this month’s Hero’s Journey feature. We’re tapping the collective wisdom of our community members to bring you reports from the front lines of the content marketing world. You can read about Belinda Weaver, our featured community member from last month. Darren’s professional experience up until this point has ranged from search marketing to e-commerce and software-as-a-service. This new business will draw from his previous experience to help serve those who want to grow online. Let’s turn this over to Darren so he can share his story. Darren DeMatas: We help e-commerce entrepreneurs turn their ideas into a sustainable business with free courses, step-by-step guides, and podcasts. I think my willingness to connect with my readers gives me a huge advantage. My number one goal is to create meaningful relationships with people. If I don’t have that, I don’t have anything. People who join our community are blown away at the personal advice I give them when I respond to their emails. I’ve always been the type of person who will roll up my sleeves and get down in the trenches with you. I think people appreciate that. Over the years, I’ve been fortunate to work with clients ranging from Fortune 500 brands to one-person e-commerce sites. I’ve also been blessed to have the opportunity to earn an MBA in Internet Marketing. Time and time again, I’ve learned that a lot of knowledge and a little elbow grease is the key to success. Darren: I’m keen on forming real online and offline relationships with entrepreneurs. It’s one of the reasons I attended the 2014 Authority conference and the 2015 Authority Rainmaker conference. Connecting offline is important to me. I think that’s what’s missing right now: content creators aren’t as responsive to their readers as they should be. Often, my readers have highly situation-specific questions that I try to answer in the most responsive manner possible. They appreciate that. Darren: I’ve been consulting as a side gig since 2008. When my daughter was born in 2013, I realized that something had to give. There was no way I could be a husband, father, consultant, and full-time employee. The freedom I’ve enjoyed over the last couple of years has done wonders for my quality of life. I see plenty of my friends still handcuffed to the corporate world, even though it’s never been easier than now to be an entrepreneur — to start your own online business. Darren: For the last two years, my business was focused on high-touch consulting. Expectations were steep, and my time was scarce. It started to drain me, and I realized it wasn’t scalable. I was only able to help out a few businesses at a time. My own business wasn’t one of them! I’ve decided to forgo short-term sales to focus on a long-term business strategy. Building an audience is something that I’ve always wanted to do. I’ve done it for others, and I am super energized to build my own audience now and help people learn e-commerce. I’m working with some friends to start our own e-commerce store and will be sharing that story on my blog in the future. I am also super pumped to be running a multi-author blog. This way, I can bring some additional expertise to the content creation and education we have planned. Darren: Recently, I started experimenting with content upgrades: additional information I offer in conjunction with my content. They go beyond what I publish publicly on my site, and my readers have to opt in to get access to them. I’ve offered everything from ebooks to complete courses with coaching. Readers respond to the upgrade offer, provide an email address, and get instant access to the information I’ve prepared. Previously, I only had a single offer for my entire e-commerce traffic course. Once I broke that into smaller pieces and positioned each lesson as a content upgrade, more people have signed up for my free information. This works well for me because I can more effectively target the lessons based on the content that people are reading. Darren: I have used StudioPress themes, Scribe, and Synthesis on every client site I have built and marketed over the last few years. I am currently in the process of adding a custom Genesis theme to an e-commerce site I help run. I’ve used Genesis for more than three years, and I love how well it works. I don’t have to worry about gobbledygook code that slows down crawlers or crashes out when WordPress updates. I do like tinkering to see what else is out there. I am always willing to try out new products and other software, but I always end up back on Copyblogger products. Our current site is in the process of being set back up on the Genesis Framework after we tried a different theme and weren’t happy. I’ve been an active participant in Authority, too. Most of what I’ve learned about content marketing, I learned from Copyblogger and Authority. 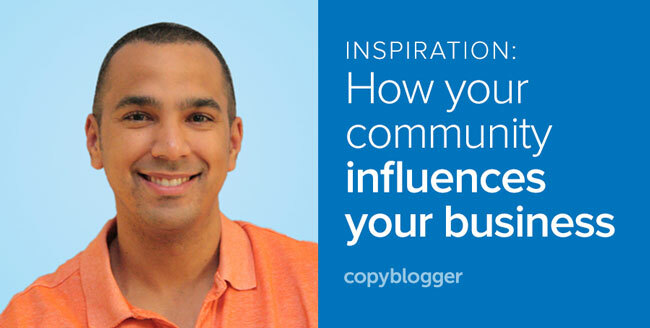 I think the best ‘product’ Copyblogger has is the community you’ve built. To me, you’re friends that happen to make cool content marketing tools and software. Sonia Simone and Darren DeMatas at Authority Rainmaker 2015. The networking and education I’ve gotten from Authority, the Content Marketer Certification program, and the two Copyblogger conferences have been invaluable to me. Each time I attend a conference, I leave with more real-world connections. We read and share each other’s articles, and also help keep each other accountable. Things can get really lonely as an entrepreneur. Any time I get stuck, I can ask a question about my business and get a thoughtful response from the Copyblogger team. Darren: My number one goal right now is building a community around Ecommerce CEO. Eventually, I want to launch productized services and software to help people launch and market an e-commerce site, but I am a long way from that. I know where I want my business to go, and I have the tools I need to get it there. Thanks to Darren for appearing in our Hero’s Journey series.